Designed specially for general handling applications, the Portwest DermiFlex Micro PVC Grip Gloves A351 use a micro PVC coating to ensure excellent levels of grip. 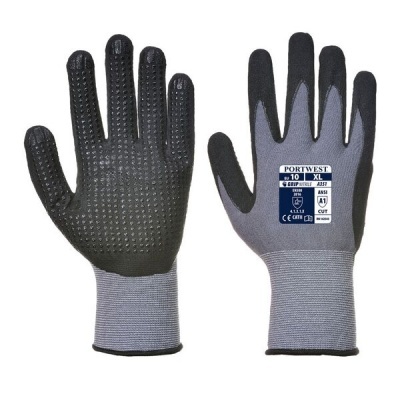 This is supported by a highly flexible and thin 15 gauge nylon and elastane liner, as well as a breathable hand cooling design that ensures that the user excels in applications such as general and precision handling. The Portwest DermiFlex Micro PVC Gloves A351 are available in three sizes that should suit the hands of most users. Please measure the circumference of your hand around the knuckles (excluding the thumb) with your hand open and your fingers together, and the length of your hand from the tip of your middle finger to your wrist.